Grand opening of US Products Pavilion aka Marathon Ginseng Beijing LTD. Attended by dignitaries, partners, friends, classmates from grade school to med school, relatives. 600,000 viewers watched the live broadcast online. It’s great to set up an office in Beijing after 30 years in the West. Dr Jiang, Founder and CEO, with Co-Founder David Monk at the Ribbon Cutting Ceremony, celebrating new renovation and 8th anniversary for Marathon Ginseng! Thank you all Ambassadors from Wausau Chamber of Commerce and Joan Monk and Percy! 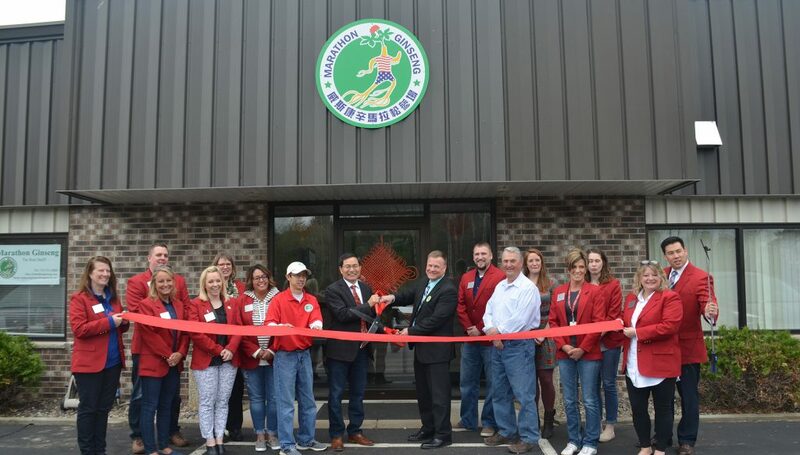 Marathon Ginseng International, Inc. celebrates 8 years in business. 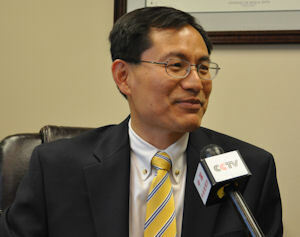 Dr. Ming Tao Jiang, founder of Marathon Ginseng International Inc is featured on China’s PBS, CCTV, on his success story when he became a ginseng farmer seven years ago. Click here to view the video. On Friday before grand opening at noon , Join us at the Round Table Discussion on International Standards on American Ginseng at 8:30 Am led by Dr. Ed Lui of Ontario Canada (for the industry) and followed by a public presentation at 10 Am on American Ginseng and Chinese Medicine by Dr. Aimin Wang, LAc of American Association of Chinese Herbs at Marathon Ginseng. Be sure to stop by the festival’s photo booth sponsored by Marathon Ginseng Gardens. Make sure to get your photo and use #ginsengfest2017. Visit our booth on Third Street just steps from The 400 Block and learn about the health benefits of ginseng. Dr. Ming Tao Jiang, founder of Marathon Ginseng International Inc is featured on China’s PBS, CCTV, on May 31, 2015. His story was told by the program “Road to Success” which features renowned individuals in their pursuit of life’s goals as an inspiration for the younger generation. 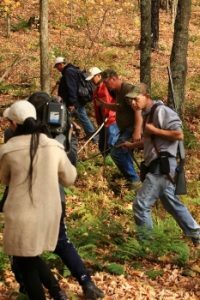 The “Wisconsin Ginseng” documentary filming Marathon Ginseng’s crew and China Central Television (CCTV) is making its debut on CCTV-10! Time: August 11 ~ 14, 2014 US-China Time 8 AM / 7.45 PM CST. The documentary “Ginseng”, is the first documentary series in China to showcase the film “百草之王” (translates to “The King of Herbs”), which interprets the mysterious and ancient legendary goddess from the aspects of history, culture, society, folklore, science and technology. The documentary uses a creation approach, exploring into people’s family lives in China, South Korea and the United States, to show the history of the development of ginseng in various countries, about their love story for ginseng. Through the means of high-tech imaging, the first realization of the use of aerial photography in the virgin forest take pictures of people, and the use of time-lapse photography, we ca take a look at the results of ginseng from the time you start planting, their growth process through cultivation. At the same time, from a global perspective, it reveals the similarities and differences in Chinese participation in Korean ginseng and American ginseng in terms of natural habitat, cultural awareness and environmental protection. 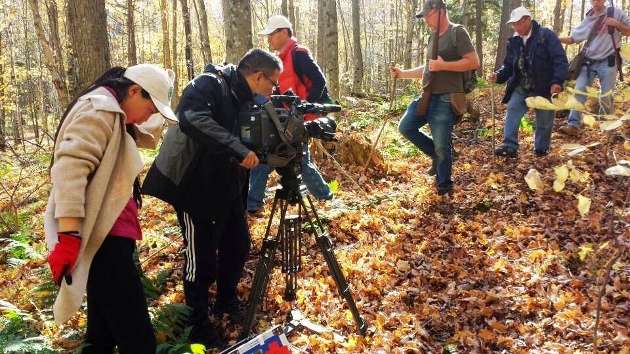 China Central Television (CCTV) Documentary Channel and Marathon Ginseng Co-Produce a Special Documentary on “Wisconsin Ginseng” will be broadcast in 2014 and released worldwide. A rainy and humid Spring and Summer has wreaked havoc to ginseng plants from seedlings to mature crops,as they prefer moist but not wet soil. As a result, price bidding for prime ginseng has come earlier than previous seasons. The 2013 harvest is expected to be better than 2012 which had the worst yield in recent memories, price is expected to be significantly higher as market demands outgrow harvest for Wisconsin ginseng. Despite a cooler than usual Spring, ginseng plants return to full life, well and sound. Daily routine returns to normal maintenance and care at Marathon Ginseng Gardens after 3 busy weeks of raising the sun shade to shield the new plants from the summer sun, Along with the new season, we have welcomed many VIPs to the farm, to share the sights and sounds at the Gardens and the life stories of a ginseng farmer, Marathon Style! Marathon WI. The 2012 ginseng harvest season is over for most farmers. The severe drought this year and May freeze 3 years ago have resulted in the lowest crop harvest in decades. It is estimated only 300,000 pounds of ginseng is produced in Wisconsin in 2012. Higher demands from China and tighter supply have created another season of near historic high prices not seen since the 1980s, The new harvest is being cooled and dried and will hit the market soon with their super aroma unique to Marathon Ginseng! American Ginseng or Panax Quinquefolium is an endangered species and its international trade is regulated by CITES (the Convention on International Trade in Endangered Species of Wild Fauna and Flora). Lately, many customers have tried to send packages of American Ginseng to loved ones in China but had their gifts seized by the US authority. Amid the strong wind and chilly weather, 33 golfers from Greater Milwaukee area and Chicago competed in a friendly championship at Ironwood Golf Club in Sussex, Wisconsin. 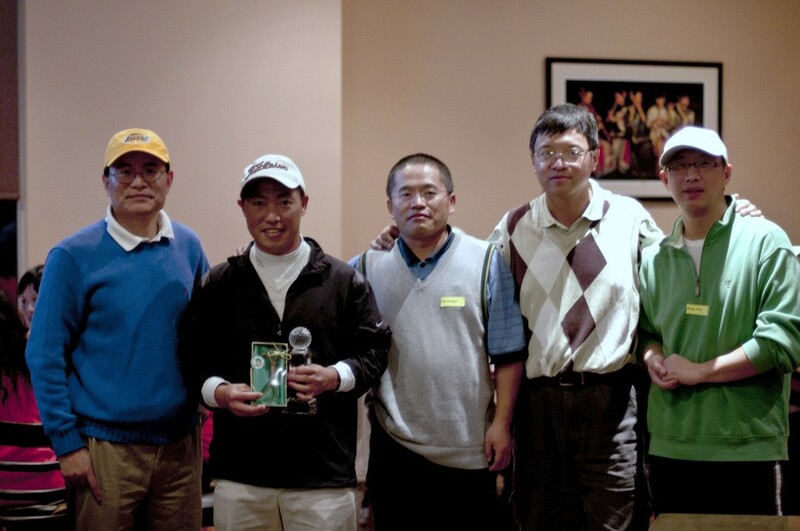 After 18 holes of fierce competition, Kao Vang from Sheboygan Hmong community won the championship with a score of 85, William Huang came in the second place and Shanlong “the Cannon” Hu came in the third place. Na Ning from Chicago won the lady’s competition. Thw winners were presented trophies as well of gifts of Wild Ginseng from Dr. Jiang of Marathon Ginseng International. Six world women’s champions studying at University of Wisconsin-Madison visited our ginseng garden at the Monk Farm. Among them, World Kayaking Champion Zhong Hongyan, World Swimming Champions zhou Yafei and Tang Jingzhi, World Curling Champions Zhou Yan and liu Yin, World taekwondo Champion Wang Suo, World Weight Lifting Champion Qiu Hongxia (48 kG), along with the Chinese wresting coach Wang Delong. The guests were warmly received by the Monk family, who has a tradition of winning state championship in wresting. The guests were excited to visit a ginseng farm for the first time. 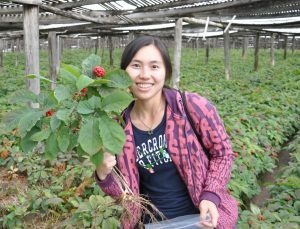 They followed the traditional Chinese ritual of tying a red thread on the ginseng stem before digging and picking the red berries. It’s a life time experience for the visitors. A crew from the China Central Television (CCTV) visited the Marathon Ginseng Gardens recently and interviewed Dr. Jiang about our ginseng distribution and community service. The guests toured our ginseng gardens and were impressed by the green ginseng plants in full bloom, surrounded by deep forests. CCTV is China’s equivalent of PBS. Internationally-acclaimed opera singer Baritone Sun Yu was invited by Marathon Ginseng International to perform at Sharon Lynn Wilson Performing Arts Center in Brookfield, Wisconsin on Nov 27, 2011. Dr. Jiang, President of Marathon Ginseng International, gave a a talk on “Medical Research: a review of the past 20 years” to doctors and graduate students in Zhejing Children’s Hospital in Hangzhou China. 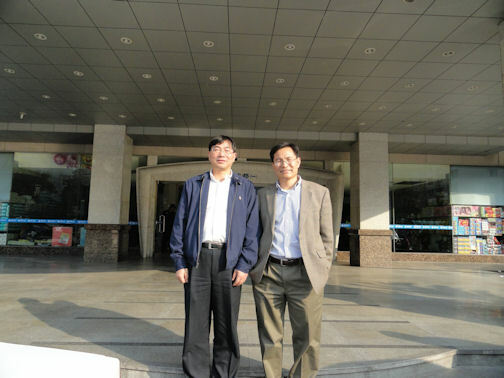 He was invited by Dr. Shu Qiang, VP of the Hospital and Dr. Zhu Shankuan, Exectiev Dean of Public Health, Zhejiang University. A group of VIPs from Beijing including Mr. Wu Li of Toward Group visited Marathon Ginseng Garden. The guests visited the farm and saw ginseng being dug. They had fun picking up ginseng behind the plough. This is their first visit to a ginseng farm in Wisconsin. The Toward group purchased the Northridge Mall in Milwaukee last Year. Marathon Ginseng International proudly sponsored of the Moon Festival Cooking Competition of Northeastern Wisconsin Chinese Association (NEWCA.org). The winners including Dr. Bo Shi for his tofu curd sheets and Dr. Shu-Ping Zeng of steamed flour and meat balls. Dr. Jiang presented a seminar on Seasonal Affective Disorder and the potential benefit of Ginseng in combating it during the long Wisconsin winter. Marathon Ginseng International is the proud sponsor of the Third Milwaukee Chinese Times Open Golf Championship held in Kettle Hills in Richfield WI. About 20 golfers from around Wisconsin participated in the friendly. Each winner was presented with a unique bouquet of Ginseng plants with green leaves and red berries by Dr. Ming Tao Jiang, Editor-in-Chief of the newspaper and President of Marathon Ginseng International. Nine prominent scientists/physicians have accepted our invitation to serve on the board of scientific advisers. We appreciate their support and enthusiasm about Ginseng research.